Armine Galstian is the Public Relations Assistant at Valerie Allen Public Relations, Inc. After interning at Valerie Allen in the Summer of 2018, she was offered a position thanks to her hard work, impressive writing skills and ability to think outside the box. 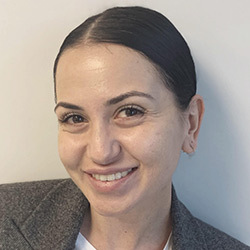 Before joining Valerie Allen PR, Armine worked at Citrus L.L.C where she aided in event coordination in the fast-paced atmosphere of the hospitality industry. Armine has always had a love for entertainment and prides herself on her charismatic demeanor and work ethic. She enjoys assisting with red carpets, connecting with clientele, and managing social media. She is responsible for various administrative and media-related tasks such as participating in brainstorming and planning sessions, tracking media coverage, developing press clippings, aiding in internal marketing efforts, and maintaining the smooth running of daily operations. She currently attends California State University, Northridge and is majoring in Communication Studies with an emphasis in Public Relations. She will graduate with her Bachelor of Arts in Spring 2019.